At Jerk Shack in Belltown, try the signature jerk fried chicken, with abundant flavors and just as abundant portions, for a great price. Trey Lamont’s Jerk Shack is a ray of sunshine in the bleak Seattle winter. If the mango-yellow walls, turquoise benches and Technicolor art don’t warm you up, the cordial service and Caribbean-inspired fare definitely will. The cigar boxes on each table that hold knives, forks, serving spoons and brown paper napkins are a holdover from the six years this place was The Innkeeper. 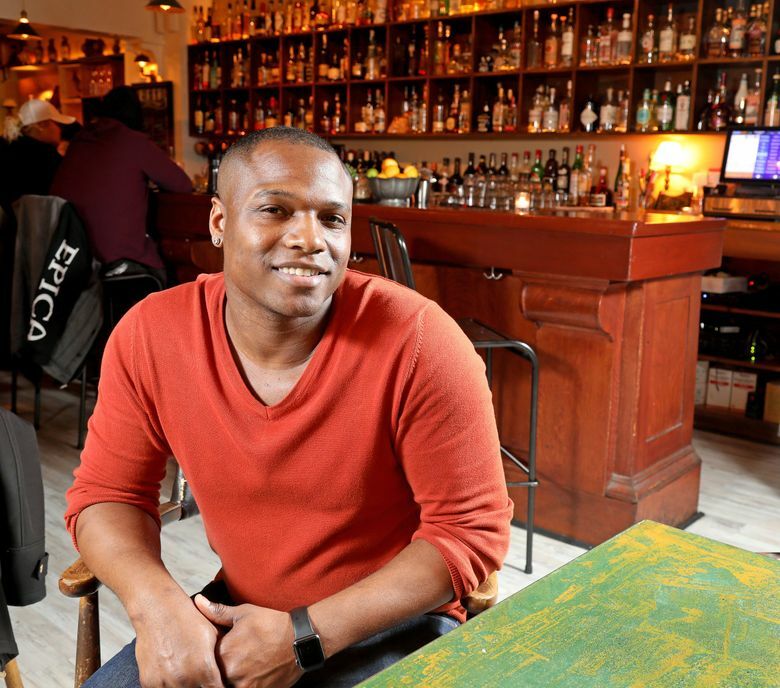 But old-timers will remember this Belltown spot across from El Gaucho as the longtime home of Marco’s Supperclub, where co-owner Donna Moodie’s family recipe for jerk chicken was a menu mainstay. on Capitol Hill, but those small-plate-focused “gastrotaverns” are nothing like Jerk Shack, where the copious portions are built for two and sometimes will feed more. The signature jerk fried chicken is half a bird presented on a wooden board that also holds fried green plantains, a mound of fragrant, pistachio-topped rice, and finely shaved cabbage slaw rambunctiously dressed with a citrus-sharpened version of the house aioli, “Papa Mayo.” All that for 20 bucks. A bowl of that garlic-heavy Papa Mayo, and another of habanero pepper sauce, aptly named “Oh Boi,” accompany the chicken. Not that it needs any sauce. Before they hit the deep fryer, the brined birds steep for at least 24 hours in a dry rub of aromatic spices (allspice prominent among them), herbs, chilies and garlic. Flavor goes bone-deep beneath the chicken’s brittle, blackened sheath of coffee-colored skin. 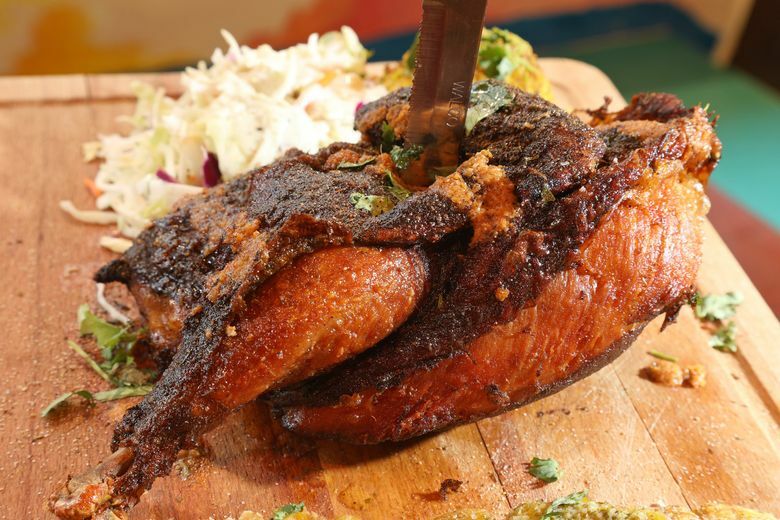 The dry rub and deep frying are twists on the traditional method for jerk chicken. Its origin dates back to the 1600s in Jamaica, where African slaves hid in the mountains to escape Spanish and British colonizers. To subsist, they hunted wild boar, preserved the meat with spices and chilies, and cooked it in underground pits to avoid detection. Today, there are as many different variations on jerk rubs and marinades as there are cooks in Jamaica. Allspice, thyme and hot chili peppers are the holy trinity each typically has in common. Jerk is traditionally cooked over green pimento wood or laurel. Lamont uses hickory, apple and mesquite for his jerk-seasoned ribs. They smoke for hours before they are finished to order on a gas grill. The ones I had ended up a little dry, nothing a dab of Papa Mayo or Oh Boi couldn’t fix. A juicy grilled rib eye came under a blanket of smoked and candied jalapeños, onion and house-made bacon. On the side were yucca fries, crisp but with a denser texture than potatoes. Those meats also come with slaw and pistachio rice (fluffy and fragrant on one occasion, sticky and less aromatic on another). So does salmon. Its “Cuban-spiced” seasoning delivers a bit less heat than the jerk rub. Lamont purchases wild salmon when he can, but the thick, sizable fillet I had was farm-raised Canadian, pan-seared in butter, oven-finished to medium rare and value-priced at $16. One or more sides can make any of these meals a feast. Cornbread has bits of sweet potato embedded in its cakelike crumb, and a pot of honey-chile-ginger-garlic-lime-butter is best applied with abandon. Also on the must-have list: crisply fried green-plantain patties drizzled with tangy Papa Verde sauce (cilantro, garlic and lime); jerk mac ’n’ cheese under a thick crust of sharp cheddar and jack; and Cuban black beans flavored with scraps of house-smoked pork shoulder, the same citrus-and-tequila-braised meat that gets pressed into the Cuban sandwich, which I regret not trying. Lime-dressed mango “salad” is more of a chunky salsa. It had enough onion, cilantro and chilies to distract from the fact that some of the fruit wasn’t quite ripe. Mango plays a bit part in another salad that weaves sweet morsels of snow crab with arugula, cucumber, avocado and green onion. It’s substantial enough to be an entree and a good choice for diners who want something lighter and less piquant. 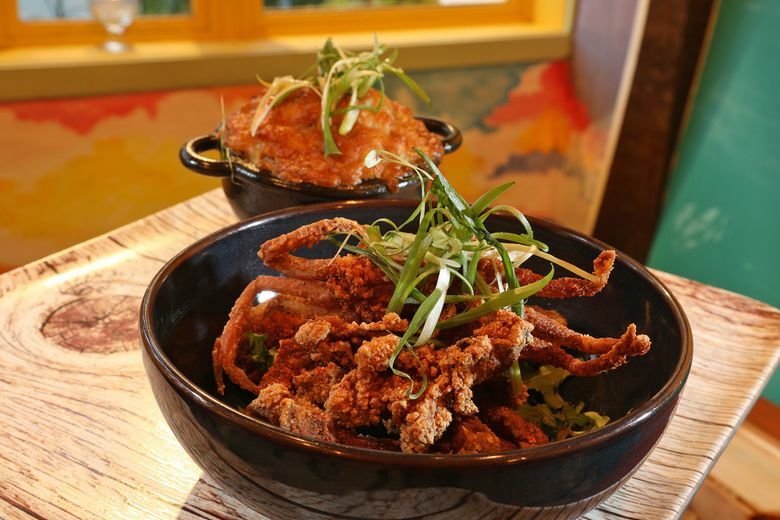 Deep-fried soft-shell crabs make a great starter. Eight or nine (I lost count) come with a side bowl of Papa Mayo for dipping, and later drizzling over the shaved green onion and arugula the crabs nest in. Their airy crunch and peppery finish make them ideal companions for the Caribbean-themed drinks Lamont creates with operations manager Bridget Babcock. All sound tempting. The ones I tried neatly balanced bitter, sweet and sour. I loved the fresh nutmeg speckling the fruit-juicy Vincey rum punch, but I’d have liked a little more ginger in the cachaça-based Ginga Rinha, essentially a caipirinha with pineapple juice. For the Manhattan, Old Grand-Dad hooks up with now-generation liqueur, Boomerang. It’s made by Woodinville-based BroVo Spirits in collaboration with bartender Micah Melton of Aviary fame, but with its rich fruit, citrus notes and traces of cinnamon, vanilla and pepper, Boomerang might have been born in the Caribbean. Cinnamon and vanilla course like a trade wind through spoon-tender bread pudding, as well. Unlike the very wet tres leches cake, that mini-loaf is a thing of wonderment, browned in butter to order, doused with coconut-milk caramel sauce and sprinkled with finely chopped pistachios. A little scoop of honey-vanilla ice cream on the side is a lagniappe, and a fine one. For a large group, the server brought two scoops, testament to gracious service that is a large part of the restaurant’s appeal. The hospitality is intentional and it starts at the top. Lamont goes from table to table chatting up strangers and hugging friends. “When you go to the Caribbean, they make you feel at home,” says this Seattle native. “I want people to escape the clouds of Seattle and feel like they are in the Caribbean. I want them to feel good.” Mission accomplished.